Stars: Matthew Broderick, Jean Reno, Maria Pitillo, Hank Azaria. In this American Godzilla movie from the makers of Independence Day, Godzilla is said to be a mutation caused by years of nuclear testing on the French Polynesian islands. Matthew Broderick stars as Nick Tatopolous, a scientist studying mutant earthworms at Chernobyl, who is summoned to Panama to study evidence of Godzilla’s movement inland. Before you know it, the creature is spotted smashing through the streets of Manhattan. As you might expect from the makers of Independence Day, this plays as more a disaster movie or dinosaur movie than a monster movie. Joining Broderick’s character in the effort to stop Godzilla’s path of destruction are Jean Reno as a French secret service agent, Maria Pitillo as aspiring TV reporter and Tatapolous’s old flame Audrey Timmonds, and Hank Azaria as Audrey’s cameraman. The human stories and efforts to stop Godzilla (and hundreds of offspring) are played only half-seriously despite the level of devastation. Part of the fun of a Godzilla movie is in watching people run for their lives, but it’s surreal to watch it fictitiously happen in New York since 9/11. Godzilla was panned by critics and fans back in 1998, and I didn’t get around to seeing it then. 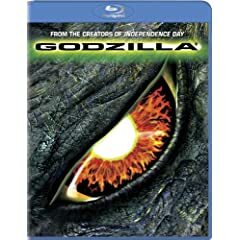 Its special effects don’t hold up too well, but it’s worth a look to curious die-hard Godzilla fans and those who want to see how it plays in high definition. The Blu-Ray includes a commentary on the visual effects, a behind-the-scenes mockumentary with Harry Shearer, a medley of Godzilla’s best movie fights, a music video, a Scene It? style trivia game, and an available digital copy.